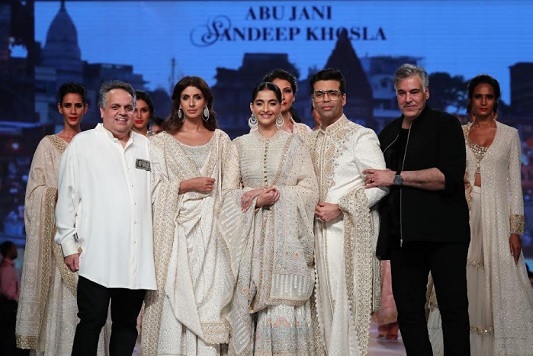 The weekend brought one of the most awaited events of the fashion with heart calendar as Abu Jani Sandeep Khosla presented a fashion show to celebrate 50 years of The Cancer Patients Aid Association. “It is an immense honour and privilege to work with CPAA for the third year in a row. Their work to empower and heal people and families affected by Cancer is unsurpassed. As they mark 50 years of committed service to the community, we are delighted to be a part of this event. Cancer is treatable and beatable. Let’s all be a part of this fight,” Abu Jani & Sandeep Khosla. The duo have chosen to pay tribute to India’s textiles and embroidery legacy at their presentation for CPAA this year. Entitled ‘Inheritance‘ it is a spectacular expression of heritage textiles from across the country, each used as a canvas for spectacular embroideries. This joint initiative by Fevicol and CPAA aims at raising funds for the Cancer Survivors and help them to lead a happy and healthy life. In this edition of ‘Fevicol Caring with Style’ fashion show, renowned duo-designer Abu Jani & Sandeep Khosla along with queen of drapes, fashion designer and politician, Shaina NC showcase their collection. “We have sourced the most exquisite fabrics and textiles from across India, from leading weavers and companies. Each an expert in a particular weave. These fabrics form the DNA of this collection. Our flight of fantasy to take our inheritance and create beauty,” Share the duo. There was a power packed celebrity presence on the ramp which included Sonam Kapoor Ahuja, Karan Johar and Shweta Bachchan Nanda, each of them supported this incredible cause. Shweta Bachchan wore an ensemble from The ‘Chakra‘ collection. This is a new expression of a vintage AJSK range. Soothing earth tones come alive with elaborate multi-colour resham and gold gota hand-embroidery in this ghagra. Worn with both a dupatta and an exquisite bandhini sari from Ahmedabad as a drape. The bandhini sari has been sourced by the duo and enhanced with embroidery and accents. A wonderful melange of drape, printing techniques and elaborate craftsmanship to create majestic beauty. The final touch was the chandbalis and kadas, delicate maangtikka designed by Abu Jani Sandeep Khosla crafted by Saboo. Abu Jani Sandeep Khosla would like to acknowledge the contribution of the following textile creators, each of whom’s work played a fundamental role in the conception of the collection, Inheritance.